Bottom tank for fresh cut flowers. Verdenaturaè is a refrigerated exhibitor for florists that need to create a big showcase place of their products using minimum space in their shops. Positioned inside a shop, florists that chose Verdenaturaè created a space where their clients can easily pick their favourite flower composition and go to straight to your cash machine. The self-adjusting cooling system keeps your product at the ideal temperature, avoiding thermal stresses and drastically reducing waste. At the end of the day, florist can close the front opening of this model with the included PCV courtain. 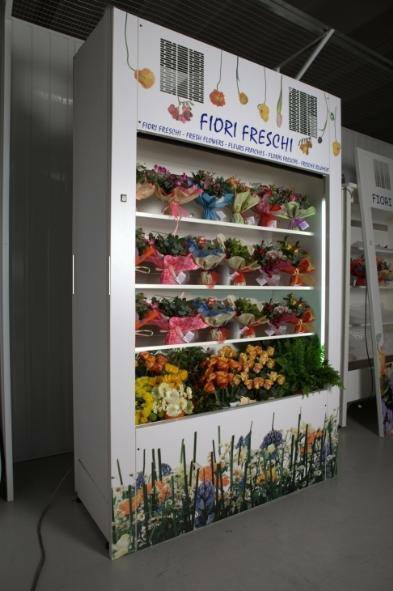 Easy to use, this refrigerated exhibitor requires the minimal maintenance.